While most everyone equates the names Saarinen, Knoll, and Eames with Cranbrook, there are hundreds, if not thousands, of people who have contributed to the community whose stories have never been told. We archivists thought it would be interesting to tell some of their stories here. The first is Myrtle Hall. She was not an alumna, faculty, or staff at any of the Cranbrook institutions, however, she did work at the Academy of Art as a model for drawing and painting students in the late 1930s and early 1940s. Not much is known about the models – there are no employee files for them, and their names are not listed in reports or meeting minutes. Fortunately however, I did uncover evidence that a line-item, established in the budget for the Academy of Art’s 1934-1935 academic year, specifically provided funding for the life models for the drawing and painting classes (taught by Wally Mitchell.) Models worked twenty-one hours per week. 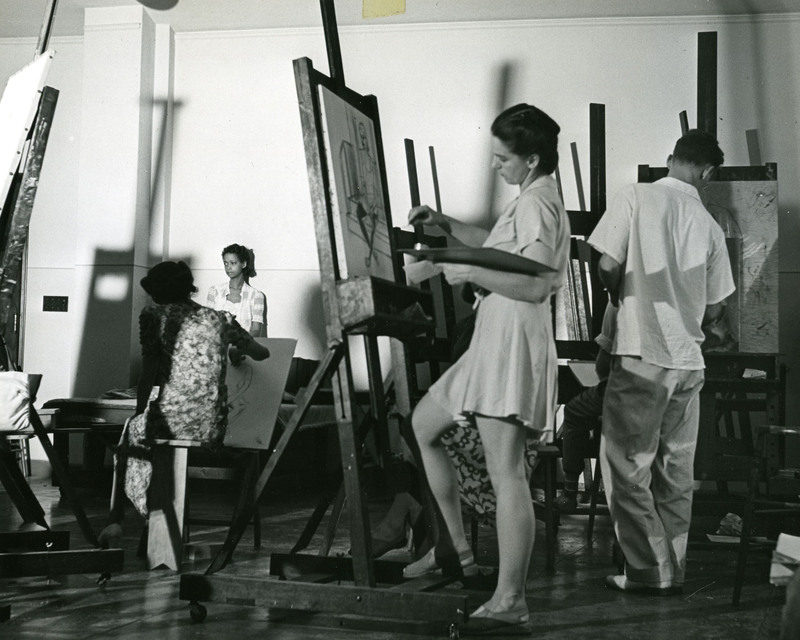 Painting and drawing class, summer 1940. By her own admission, Myrtle was the “first black model at Cranbrook” and for that matter, the first black model in the Detroit area including at the Meinzinger School of Art. In addition to modeling, Myrtle was also an artist herself and a member of Detroit’s Pen and Palette Club, which was formed in 1925 by the Detroit Urban League to help young artists exhibit their works. In 1935, Myrtle received an award for one of her paintings at the club’s Ninth Annual Exhibition. 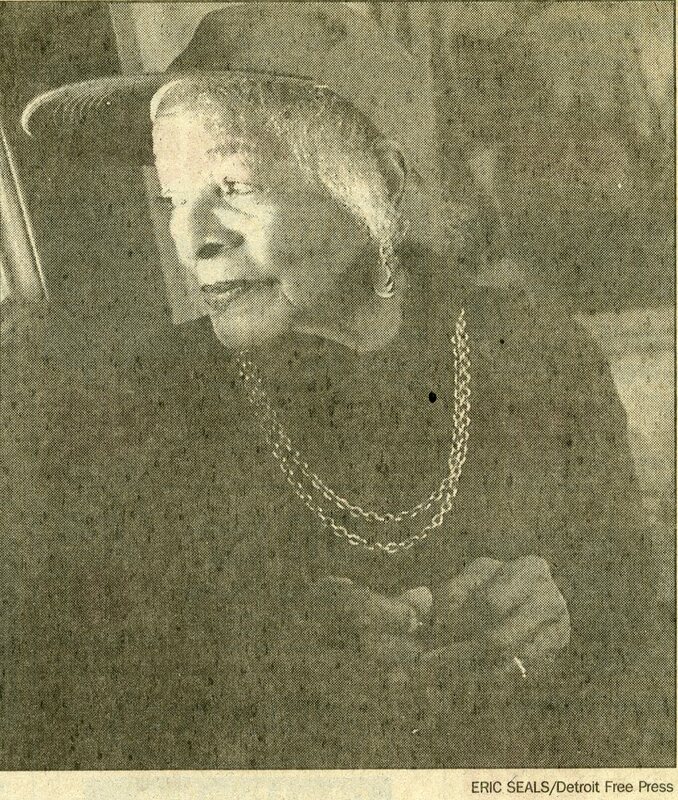 She also studied for a time at the Society of Arts and Crafts, exhibited at the Detroit Artists Market, and was one of the founding members of the Extended Arts Gallery (1958). During the 1940s, Myrtle abandoned painting and became an accomplished ceramicist. She had her own pottery studio (which she designed herself) on Erskine Street in Detroit. The studio was filled with antiques, paintings and sculpture by Michigan artists, as well as her own ceramics and of course her kiln and glazes. In a 1963 interview, she stated “I can’t stand things that are useless” and her oven-to-table casseroles, salad bowls, drinking mugs, and lamp bases reflected just that. Myrtle Hall, Detroit Free Press, Mar 1994. Editor’s Note: We do not have any biographical information on Myrtle, but if you know anything about her, please let us know! Thanks for the good work Leslie. Your point is so true! There are many unseen and unknown contributors to Cranbrook. This has become my weekly treat! Thanks for all the interesting tidbits.